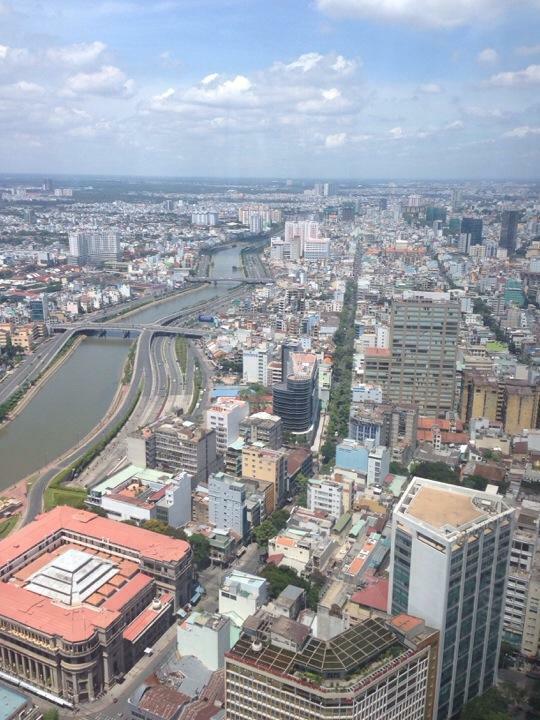 Blog from Ho Chi Minh City, Vietnam | Hello World! Our first day in Vietnam! And what a great city for our first stop. We arrived yesterday evening and got picked up from the very quiet airport and whisked straight to the front door of our hotel. It's s lovely little guesthouse tucked down a little alleyway called the Bich Duyen. Kind of hard to find by ourselves though as we discovered this evening! In our trusty lonely planet guide there's a walking tour which takes you around old Saigon so after a massive breakfast at the guesthouse off we went. 4 hours later we were zonked but had managed to see loads of sights and old buildings such as the Ben Thanh market, the opera house, the Continental hotel (which is cool as it's in a book I'm reading about Saigon during the war at the moment), Lam Son park, a statue of Ho Chi Minh, the former city hall, the Notre Dame cathedral and the Reunification Palace. On our way past we also went up the Bitexco Financial Tower which has an observation deck on the 49th floor. It's pretty much the only skyscraper in the city so looks a bit out of place, but it really helped to give an idea of just how sprawling the city is. One of our proudest achievements of the day was managing to cross the road without and drama. This may sound an easy task but no. The streets are filled with hundreds of motorbikes whizzing around everywhere. We'd heard that the trick with crossing roads was just to walk and the motorbikes will scoot around you. It worked! We spent the afternoon in the War Remnants museum. Quite a big place, full mainly of photographs depicting various aspects of the war. One gallery was devoted to anti-Vietnam war protests throughout the world, another one to the use and effects of Agent Orange, which was pretty horrific. On the walk back to our hotel we got stopped by a group of students who asked if we would mind sitting with them for a bit to talk English with them. There ended up being around 10 of them all huddled around Kate and I asking questions about England, and telling us about their country in return. They were all from different universities but had met up to practise English. Very cool. As we were leaving they gave us each a cloth purse as a thank you for our time! All in all a very successful day. Really interesting city - a huge mix of colonial architecture left over from the French, and tiny little alleyways and electricity poles with hundreds of wires sticking out precariously!